In 2010 when Anna Hazare for the first time sat on Anshan demanding Jan Lokpal at Jantar Mantar, he was supported by a handful of people. Anna hazare was by no means the ‘VOICE OF THE PEOPLE’ but the government readily accepted him as the voice of the people and invited in for talks on the formation of jan lokpal. The events which followed where closely tracked by the media and the popularity of Anna started growing subsequently because of the carefully crafted media strategy by Arvind Kejriwal. Nothing satisfactory came out of the talks and soon Anna started to fast again at Jantar Mantar. This time though there was something extraordinary happening at Jantar Mantar . The popularity of Anna and team Anna grew exponentially . The so far distressed Indians found a new hope in the movement. Anna was compared to Gandhiji. Slogans like “Desh mein naya andhi hai, Anna desh naya Gandhi hai” were heard all across India. People of India especially the middle class starting hoping for a change and Anna actually started becoming the voice of the people. Thousands started gathering at Jantar Mantar. The political class could not ignore the voice of the people anymore . It was the perfect time for the political class to hear the voice of the people. But instead of addressing the demands of the people, they decided to arrest Anna. The movement grew bigger and was at its peak. Lakhs gathered at Ramlila maidan. The aam aadmi of the country was roaring with energy but the people in the parliament did not heed to the demands of the people. At this moment, Government of India never acknowledged Anna as the symbol of frustration among the masses, instead question the legibility of the opinion and representation of ‘civil-society’. Arvind Kejriwal soon realized that the political class was taking the movement for a ride and nothing will come out of the movement. He decided to float a new party called the Aam Aadmi Party (AAP) after the outcome of a nation wide online referendum. Aam Aadmi Party chose Delhi as its first battle ground. People of the country soon realized that entering the political system is the only way to change the course of the county. People from across the country helped Aam Aadmi Party script a spectacular debut in the political arena and soon Aam Aadmi party became the real voice of the people of the contry ( Delhi especially). 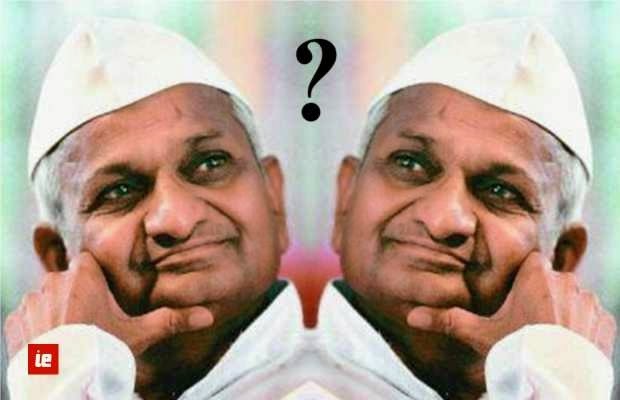 Soon after the Delhi results Anna Hazare is now again on fast. There are a very few people who think his method of working will work and this is quite evident by the number of people present at his fast venue in his hometown Ralegaon. Now the political class out of nowhere has again accepted that Anna Hazare is the true voice of the people of the country. Now, hardly 25 people sit with Anna at the fast venue. A large section of the country is standing up in support of Arvind Kejriwal and his political revolution but the political class chooses to believe otherwise. It is just amazing how the politicians choose whom to listen to and then make it appear as if their chosen one is the “voice of the people”. It is very astonishing that even after 3 years of the movement both the national parties (BJP & Congress) chose not to listen to the views of the people and instead choose to force their views to be the public. The “Lokpal” movement now has become more about Anna and less about the voice of the people, hence the Jokepal. It’s a farce now. Now very conveniently Anna is being acknowledged as the voice of the aam aadmi. Why? Because for some unknown reason, he has started to compromise on principles. A movement which was carried by the media as the voice of the people is now being led by the same media as the voice of Anna Hazare. The people of the country no longer call the shots in the movement. Anna has somehow become larger than the movement and the voice of the people is engulfed by the larger than life image of Anna. It is just strange how even after 3 years of the movement , the voice of the people is not heard by the political class even once. But there is hope, the Aam Aadmi party has tried its best to be this missing medium . It has taken the opinion of the people for each and every step that it has taken. After its spectacular performance in the Delhi elections it has sent ripples across the political class of the county. Never once Rahul Ghandhi chose to have a meeting with his party’s Dalit volunteers (or even aam janta) to take their views on the manifesto. BJP on the other hand had to change its chief ministerial candidate days before the Delhi elections. What a 3-year movement could not do, a one year old party has started doing. Most importantly it has taken forward the message of the people of the country. The Aam Aadmi of the country has gathered support form an unexpected corner i.e the political arena. Aam Aadmi Party has breached its own expectations and truly emerged as the mouth piece of the common man in an environment where the voice of the public is more often unheard.